Fit Rovers ambassador Matty Blair helped course 11 settle into the programme on Thursday as they began their Fit Rovers journeys. The Rovers midfielder was on hand to welcome 22 men onto the new course, helping them record their week one measurements of weight, waist circumference, height and blood pressure. 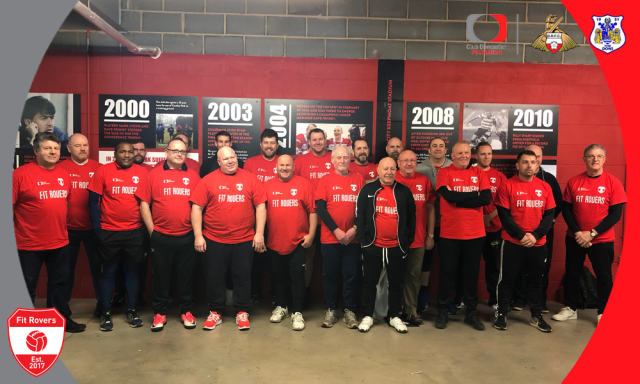 As course ambassador, Matty will be joining the men more regularly on a Thursday night, as he aims to help these men gain their Fit Rovers goals at the Keepmoat Stadium. Matty commented: “I’m delighted to be continuing as the Fit Rovers ambassador for this course; I've spent quite a bit of time with the participants so far getting to know them, and cannot wait to watch them reach their goals. A total of 64 men turned up at the Keepmoat Stadium for the vets circuit training, whilst the football session had a total of 60 participants. The vets sessions are ran by Club Doncaster Foundation staff and are exclusive for Fit Rovers graduates.